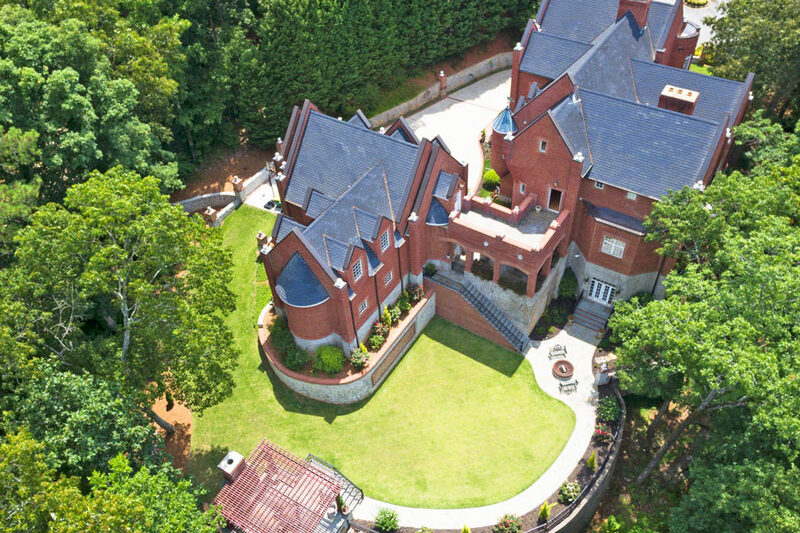 Built in the style of famed residences across Scotland and England (including the home of Sir Walter Scott), this particular Marietta manor is filled with recovered items from historic properties. The main living area spans nearly 8,000-square-feet (with a separate carriage house adding around another 1,300-square-feet) with 6 bedrooms, 6 bathrooms and 3 half-baths, and custom interiors include a 25-foot stone chimney, Honduran mahogany woodwork, antique fireplaces and an imported castle entry door from Europe. The property is now on the market at or above $1 million starting Saturday, September 9th through Platinum Luxury Auctions, a Miami-based real estate auction firm. Written by the Editors of DuJour; view the full slide show and article here. Luxury real estate auction firm Platinum Luxury Auctions is preparing for the upcoming auction sale of a contemporary waterfront estate located within the Sanctuary of Boca Raton, a gated residential community in Boca Raton, Florida. The ritzy neighborhood, situated on the western side of the Intracoastal Waterway in Palm Beach County, has been ranked by Forbes magazine as one of the most exclusive gated communities in the United States. Although recently offered for an asking price of $3.8 million, the property will now be sold to the highest bidder who meets or exceeds a bid of only $1.5 million at the live auction sale, to be held on the property site on August 26, 2017. Platinum, a firm specializing in the non-distressed auction sale of multimillion-dollar homes on behalf of their affluent sellers, was retained by the property’s owner to exclusively manage the sale. Completely renovated by its current owner in 2012, the single-story, contemporary estate offers 5,000 square feet of interior living area, with 5 bedrooms, 6 full and one half bath. It is situated on a wide, deep-water canal, and boasts 70 linear feet of dockage. The large canal, combined with the wake protection and privacy offered by a 27-acre wildlife preserve located immediately east of the community, create exceptional dockage conditions for the avid boater. There are no fixed bridges between the property and the nearest inlet, making a cruise to the Atlantic Ocean a breeze. Designed in a beach chic style with a light color palette, the residence features lofted ceilings and bright, airy living spaces, with most rooms offering views of the pool and the waterway through floor-to-ceiling windows and doors. Several bedrooms feature direct access to the pool deck, creating a seamless blend between indoor and outdoor living areas. The impressive kitchen, located just off the main salon, was designed by Pedini New York, and features Viking appliances and a welcoming, open layout that flows into the other living areas. Outdoor living areas include a large front yard with a semi-circular, paved entry, and a backyard offering a manicured pool deck outfitted in custom pavers and artificial grass, a custom pool and spa with sun-soaking deck, and a summer kitchen with video and audio systems. Additional features include a +300-bottle wine room, integrated Smart Home features controllable via iPad, a spacious master bedroom suite with a designer bath, and a three-car garage. The Sanctuary of Boca Raton has long been considered one of the most exclusive gated communities in Palm Beach County. Its ninety estates – two-thirds of which feature private, deep-water dockage – typically range from $2 million to more than $20 million in price. In addition to its namesake, 27-acre wildlife preserve, The Sanctuary offers a 23-slip marina (built to accommodate boats up to 65 ft. in length), Har-Tru tennis courts, a children’s playground and round-the-clock security patrolling both the roads and the waterways behind its manned gates. The property is available for open house previews by interested buyers between the hours of 12 and 4pm (EDT) each Thursday through Sunday, until the auction. Visitors must make an appointment with Platinum in advance in order to proceed through the community’s guard gate. Additional information is available at SanctuaryLuxuryAuction.com, or by contacting a Platinum representative at 800.678.2293. BOCA RATON — A home in the luxury enclave The Sanctuary of Boca Raton will be auctioned off and sold to the highest bidder this month, Miami-based real estate firm Platinum Luxury Auctions says. The 5,000-square-foot, five bedroom, six bathroom home faces the Intracoastal Waterway at Northeast 45th Road, off Federal Highway just south of Yamato Road. Previously offered for $3.8 million, the estate is will sell at or above $1.5 million on Saturday, Aug. 26, according to Platinum Luxury Auctions. The property has a private dock and about 70 feet of deep-water frontage. The single-story home, on a 0.37-acre lot, was built in 1982 and renovated in 2012. And a pool heated via solar panels, jacuzzi and pool deck, all with views of the Intracoastal. Additional information is available at SanctuaryLuxuryAuction.com, or by contacting a Platinum representative at 800.678.2293. A five-bedroom waterfront house in Boca Raton will be offered at auction on Aug. 26 for at least $1.5 million. The house, previously offered for $3.8 million, is in a Boca Raton residential development called The Sanctuary. Miami-based Platinum Luxury Auctions will conduct the auction. The Boca Raton house has an open floor plan and about 5,000 square feet of living space. It has six bathrooms and a half bathroom, and outside, it has a private dock and about 70 linear feet of deep-water frontage. The living room has a vaulted beamed ceiling and French doors that open to the property’s outdoor living area. The kitchen, designed by Pedini New York, features custom-made cabinets, quartz counter tops, an over-sized island and Viking Professional appliances. Among the indoor amenities is a 300-bottle wine room. The outdoor living area includes a kitchen and bar, a paved patio with a shaded dining table, a jacuzzi and a large, solar panel-heated swimming pool. The single-story house, built in 1982 on a 0.37-acre lot and renovated in 2012, also has an iPad-controlled home security system. Platinum Luxury Auctions will conduct an auction of the five-bedroom residence on Aug. 26. Additional information is available at SanctuaryLuxuryAuction.com, or by contacting a Platinum representative at 800.678.2293.